Anna Karen was born in Durban, South Africa, in 1940 and trained with the South African National Theatre. 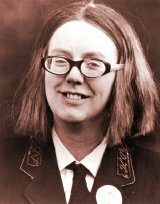 Anna Karen is, however, best known for her frumpy character, Olive Rudge, in On the Buses, the TV comedy series which ran for 74 episodes from 1969 to 1973. The series, which starred Reg Varney, Bob Grant and Stephen Lewis, made Olive a national figure, the downtrodden, dowdy wife. Anna also appeared in the three spin-off films - On the Buses (1971), Mutiny On the Buses (1972) and Holiday On the Buses (1973). 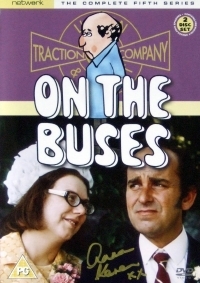 Anna Karen was married to comedian, Terry Duggan who appeared as different characters (a shopkeeper, a taxi driver, a passenger and also as Nobby) in a number of different episodes of On The Buses. He died in May 2008. 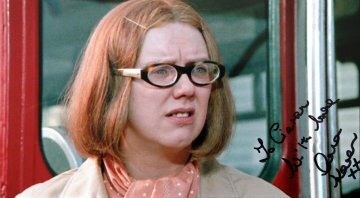 Anna Karen had a small part in Carry On Camping (1969) in which she plays one of the 'schoolgirls' (although she was 28 at the time!) unflatteringly credited as 'Hefty Girl'! In the film she has a fight with Barbara Windsor, and she can also be seen in the background, wearing a blue costume, in the famous scene where Barbara Windsor loses her bra! 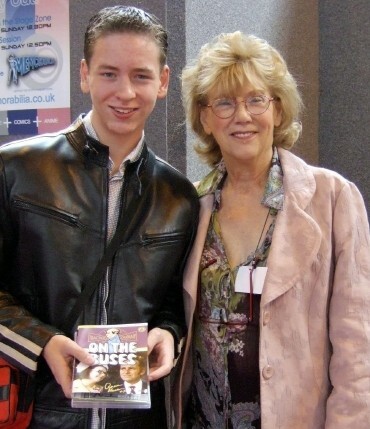 I met Anna Karen at the Birmingham NEC in July 2006. She was very friendly and I told her that I was collecting the complete series of On The Buses, which I find very funny. We had quite a long chat about the comedy, and she signed my DVD sleeve of the fifth series where she is pictured with the late Michael Robbins who played her husband Arthur. Anna Karen also appears as 'the wife' in Carry On Loving (1970) and gets covered in jelly and cream cake when all the food is thrown about in the hilarious riot at the end of the film! 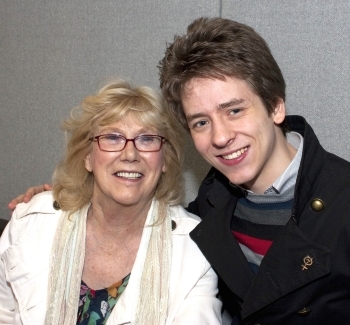 I was really pleased to see Anna again at Memorabilia held at the NEC in Birmingham in March 2011. I gave her a printed copy of my webpage about her, and she signed my photograph of her as Olive in Mutiny on the Buses. I couldn't let the occasion go by without having my photograph taken with her again! Anna Karen created another notable TV character, also called Olive, a skiving machinist in The Rag Trade (1977-1978). She also appeared as the bossy Rosita Pearman in Troubles and Strife (1985-1986). 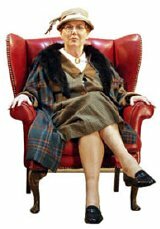 In 1997, Anna was in the soap, Eastenders, briefly as Aunt Sal (Peggy Mitchell's sister), and the character has made occasional appearances in 2001, 2002 and, more recently, in 2007.